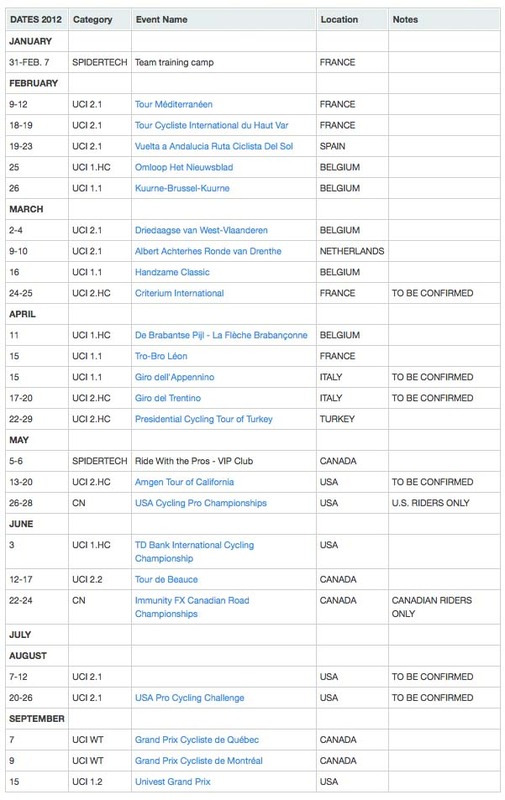 Canada's pro Continental team, SpiderTech powered by C10, has released their planned racing schedule for the coming season. At this point, some entries to events are still to be confirmed by the organizers. The team begins next week with a training camp in France, followed by the first race of the season, the Tour Mediterranean. They continue to race in France, Spain and Belgium through the early part of the Spring, before heading to Italy and Turkey for the latter part of April. In May, the team heads back to North America, with the Amgen Tour of California entry still to be confirmed at this point. The rest of the season is, at this point, confined to Canadian and U.S. events.